Building work has begun in Fife on a multi-million-pound project which will see Scotch whisky produced in its spiritual home for the first time in over 500 years. The brainchild of Drew McKenzie-Smith and his wife Helen, Lindores Abbey Distillery will incorporate ancient distilling techniques and ingredients to produce a world-class spirit. The couple are also planning to open a visitor centre on the site and produce a unique Scotch whisky which will be available by 2023. Lindores Abbey is known as the ‘spiritual home’ of Scotch whisky thanks to Friar John Cor, who paid duty on malt in 1494 in order to make ‘aqua vitae’ for the king, an act that was recorded in the Exchequer roll and is the earliest written evidence of whisky distillation in Scotland. Once completed, Lindores Abbey Distillery will sit next to the ancient ruins of the 12th century abbey built by the Tironesian Monks who originated from France. The monks worked the surrounding land and brought modern methods of horticulture, brewing, animal husbandry and distilling from the continent. Drew McKenzie-Smith said: “To us, the history of Lindores Abbey is just as important as the plans we have to create a distillery. If it wasn’t for the expertise of the Tironesian monks who came to Scotland in those dark and frightening medieval times we may not have the advanced industry we do today. “Building a distillery on this site will bring the spiritual home of Scotch whisky back to life and we will initially produce and market an aqua vitae spirit. “We’re working closely with various teams to ensure we respect and maintain the historic integrity of this unique site. We believe a whisky distillery and visitor centre will help drive tourists to this part of Fife and, in turn, have a positive impact on the local economy. The distillery is being built by converting and enlarging the original abbey steading. The current steading is made from original abbey stone and is over two hundred years old. Wood and stone from the surrounding area will be used as much as possible to carry on the tradition of local sustainability and to minimise the carbon footprint of the build. Forsyths of Rothes have been appointed as fabricators with the building specifically designed by Organic Architects of Helensburgh. International whisky expert Dr. Jim Swan will contribute his skills and expertise to create a world-class whisky which Drew believes will appeal to a global market. 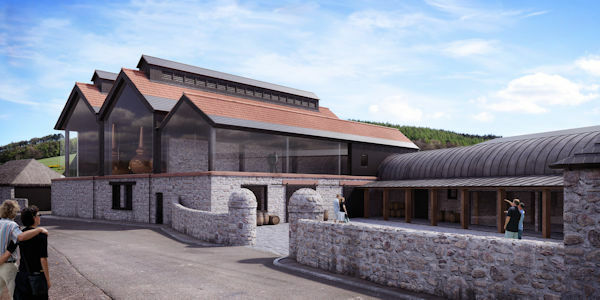 Gareth Roberts, Director at Organic Architects, said: “We are delighted to have been given the opportunity to design the new distillery at Lindores Abbey. The building will contain various contemporary materials which will compliment the traditional stone buildings. This marriage of ancient and modern reflects the character of the whisky which will be produced here. "Archaeological works were carried out before the construction started which have added more to the historical understanding of the abbey complex. Some of the archaeological trenches will be left open in and around the new building and it is very exciting to see the scale and quality of these buildings which have been buried for hundreds of years. Construction work to create the distillery is now well underway following extensive archaeological digs around the abbey ruins which boasts the burial site of the ill-fated first Duke of Rothesay following his death in 1401. William Wallace, John Baliol and various medieval kings and queens also visited the abbey before it was destroyed under instruction of John Knox in 1559.